Salt Lake Community College is taking part in a national program for veterans called Helmets to Hardhats, which provides veterans the opportunity to be educated in the construction industry. The college hosted a discussion about Helmets to Hardhats Tuesday, July 19. Among the members of the discussion were Mayor Russ Wall of Taylorsville City, Utah State Senator Karen Mayne, Helmets to Hardhats national director Darrell Roberts, and representatives from veterans organizations. President Cynthia Bioteau and Interim Dean of the School of Aerospace/Aviation Apprenticeship & Technical Specialties Rick Bouillon were the Salt Lake Community College representatives in attendance. President Bioteau began by saying, “We go above and beyond for our veterans. I think the program that Senator Mayne has brought us into is such a nice match,” she said. He told about how twelve of his employees formed a Veterans Day committee. These employees come in on their day off to help with the Veterans Day celebration. There are also representatives from other veterans organizations that sit on this committee. “We actively have a Veterans Day celebration in Taylorsville,” Wall said. 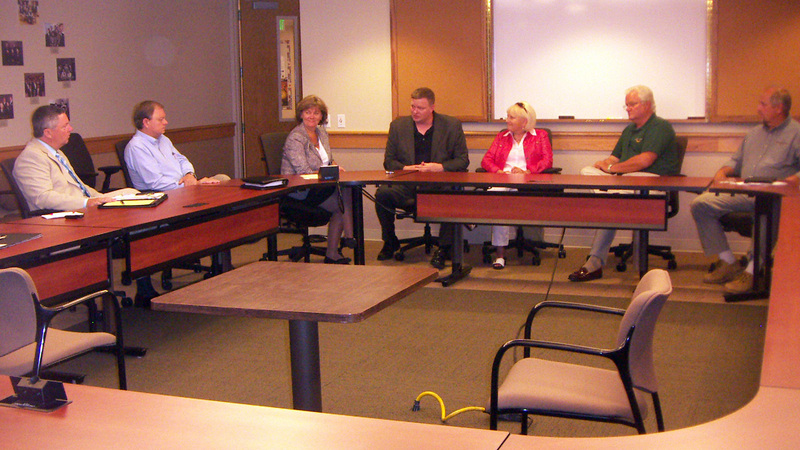 Senator Mayne told the discussion group that she has a long history with SLCC. She told of a program that veterans can attend before they are discharged from the service that helps them transition back to civilian life. “President Bioteau welcomed the Helmets to Hardhats program,” Mayne said. The Helmets to Hardhats program is designed to help veterans have a career in the construction industry. A veteran registers for the program at www.helmetstohardhats.org. Veterans that have military training in the construction industry and veterans with no experience are both encouraged to apply. “If one wounded veteran is a success then the program is a success,” Roberts said. Kevin Cote is a volunteer with Helmets to Hardhats, He is the business manager and financial secretary for Utah Plasterers & Cement Masons Local 568, he has been working with the program since 2007. “I think the program will be a big success,” Cote said. Helmets to Hardhats is the fastest way for military, reservists, and guardsmen to transition from active duty to a career in the construction industry. The program offers everything a veteran will need including world class training, a solid lifetime career, job security, a strong benefits package and a large retirement pension. The program helps veterans transition into the right position, where all a veteran has to do is pass the classes and do a good job on the work site to be on their way to a promising future. The apprenticeship programs that are recommended to a veteran are of the highest quality, with well resourced training centers. Most candidates will enter an apprenticeship that lasts four years. While doing this the veteran will earn a paycheck while training to become a master craftsperson.